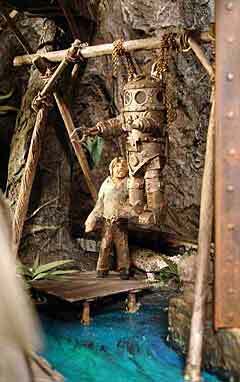 Backdrops/Backscenes, Low Relief Models, and Full 3-D Models. 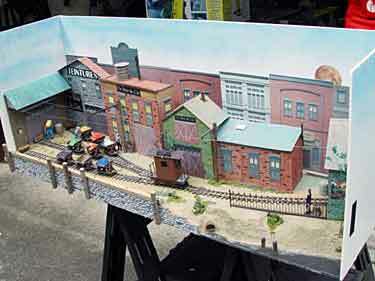 One of the biggest contributions to believability in a small layout can be a backdrop (backscene), which is especially effective on shelf layouts viewed from only one side. Paper is the ideal medium for painting or pasting a scene on a board (plywood, masonite, foamcore, cardboard, etc.) and mounting it behind the layout. Where do you get the scenes? One way is to take a photograph yourself, print it out at the required width, and mount it. The photo above, showing part of the Pittsburgh urban skyline, was taken on a sunny morning with a little pocket digital camera. It was planned as the backscene for a 27in (69cm) long shelf layout sited on the opposite bank of the Monongahela River (from where the photo was taken). It can be printed as a continuous banner (if your printer has such capability—and many do) or as a series of vertical strips about 8in (20cm) wide, carefully trimmed and glued abutting each other. In a pattern like this one with many vertical lines, the seams will be virtually invisible. Carl Arendt, who made the picture, says he finds the easiest mounting adhesive is a children’s “glue stick,” available at any store that sells school art supplies. White PVA glue, brushed over the back of the paper, will also do a good job, as will contact cement (wielded very carefully). This same technique was used by Martin Hogg, from Mansfield, England, to transform his more rural photo (below) of the romantic northern Lake District into a backdrop for his layout, Ulthwaite (see Scrapbook #82a). Martin printed the photo as a series of side-by-side vertical strips that he butted and glued on his backboard. The improvement made by a good backdrop is illustrated well by these two photos (below) of a 35x10in (89x25cm) On30/O16.5 display layout built by Joseph Norris, from Bakersville, North Carolina USA. The layout is interesting in itself: it’s controlled by a mini-notebook computer and and CTI Electronics hardware and software, using the DCC and sound capabilities of a Bachmann Forney plus two operating structures and three photo-detectors. To start the sequence, the sawmill doors at the left side open, the loco backs out (with appropriate bells, whistles, and chuffs) and moves over to the water tower whose arm swings over and down to give the loco a drink. With all that action going on, it would seem that scenery is pretty much of a side issue. But take a look! At the left is the completed layout in front of a commercial photographic backdrop. And at the right, Joseph has simply placed a photo of his backyard trees behind the same layout. QED. Calendars and magazines are also good sources for small scenes that can be pasted against a sky-blue background to fill in the spaces between foreground scenery elements (buildings, trees, fences, and such). Needless to say, the Internet is also full of small scenes that you can download and print for yourself. To find them, just inquire at any search engine for the subject you want to portray (“English village houses,” for example, or “U.S. grain elevators”). 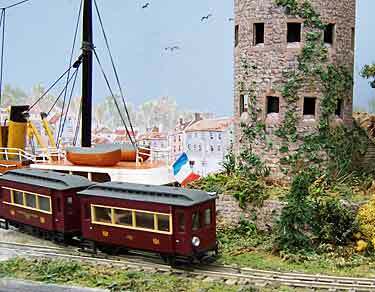 Shown here are a couple examples of well-placed fill-ins from two of Graham Watling’s wonderfully scenic OO9 (HOn30) layouts. Fotherham (at left), featured in Scrapbook #85a, contains a tiny picture of a small row of houses that fill in the space between two buildings behind the goods shed. Sampson Vale (right), in Scrapbook #41, has a longer row of buildings that represent the far side of the harbour in this port town. Notice that Graham has added a light wash of grey tone, to make the buildings appear farther away from the observer. In general, scenery “greys out” as it recedes in the distance. Similarly, Carl Arendt used individual building photos available for free download at CG Textures, an Internet source of texture and architectural shots, to create an O scale backdrop (right photo above) for a three-rail micro-layout (see Scrapbook #77). This work-in-progress photo illustrates the kind of realism that actual structure photos can bring to any layout, even this O-scale display measuring just 36x12in (90x30cm)! You can also select from an amazing variety of full-frontal building photos at Amazing Textures, and if you don’t want to print your own, there’s at least one commercial supplier of photographic buildings scaled for backdrop use—Modellgrafik. HOW ABOUT STRUCTURES LESS THAN AN INCH DEEP? The next step forward from flat backdrops is (literally) low-relief models—structures that are fully modeled on one face, but are only about 1 to 3in (2.5 to 7.5cm) deep. Generally placed against a backscene or a view divider, a low-relief structure has more realism and presence than a background picture of a structure. It’s a full model, just cut off a short distance behind its front face. Low-relief structures have been a staple of small-space modeling for many years. In Britain, well-known railway modellers like Edward Beal and John Ahern used them, and in the U.S. Frank Ellison popularized them during the 1940s. Many people first learned about such structures from a commercial range of paper kits called SuperQuick models. They’re pre-cut, 4mm-scale cardboard models of British pre-WW2 buildings, including a number of well-designed low-relief structures just 1½in (4cm) thick. The revolving layout above was made by John Maughan, from Vancouver, British Columbia Canada, in the 1960s and exhibited widely for some 20 years. It shows the SuperQuick low-relief range of kits, most of which are still available. The layout is discussed in Scrapbook #49. If you can spare a little space between your rear-most track and the backscene, a low-relief structure or two can add both realistic atmosphere and operating possibilities (as a switching spot)! 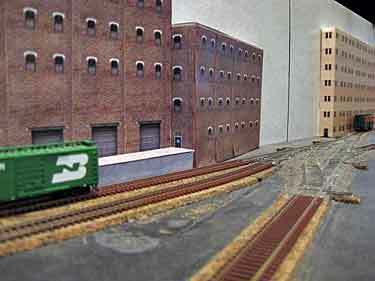 Tracy Smith, from Bothell, Washington USA, took advantage of this idea in his Fairweather Street N-scale switching layout. The aerial view shows how he is crisply modeling several industrial structures, leaving only an inch or so of depth; and the trackside view gives a notion of the reality imparted to switching chores by this strategy. There’s a bit more information about Tracy’s layout in Scrapbook #70. 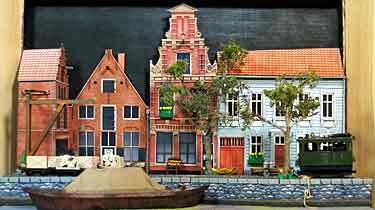 Roderik Vanderkelen, from Tollembeek, Belgium, carried cardboard modeling in low relief to new heights when he modeled a row of real buildings in Nm scale (1:160 on 6.5mm gauge). 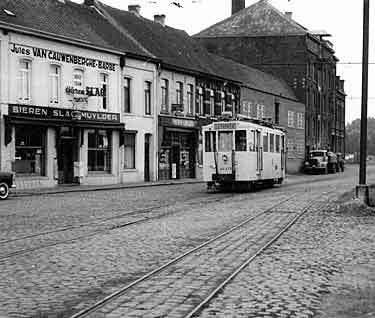 The buildings of Ninove, Belgium are carefully reproduced in this very small scale. The right-hand photo, taken from the side, gives an idea of how realistic the modeled details are. And the panorama (below) shows the over-all impact of the models. There’s more—and a link to Roderik’s website— at Scrapbook #82a. 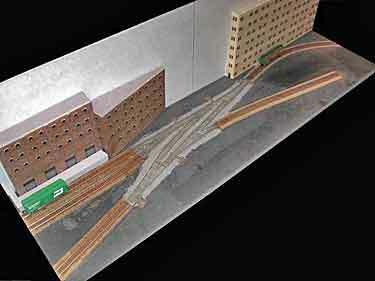 This technique for modeling whole blocks of city streets is often used by tram (trolley) modelers building shelf layouts, to set off their rolling stock models realistically. Richard’s backscene was made just like the one in Peek’s Pike, using building photos from the Internet, printed out to scale and mounted on a blue-sky backdrop. (Don’t miss the paper moon peeking over the rooftops at the right rear!) Notice that Richard has made his low-relief buildings in various depths, giving visual variety and allowing the rearmost spur of the Inglenook track fan to snuggle comfortably among the buildings. Most of the low-relief structures were assembled before printing from architectural details and textures downloaded from Mayang Textures, an internet source of free materials. There’s more about Paper Moon Tramway in Scrapbook #75a. If you prefer to design your own paper structures, it’s possible to create entire buildings, fully three-dimensional, using texture papers. 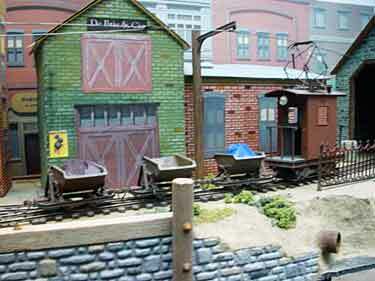 Russ Haigh, from Willoughby, Ohio USA, constructed the central mine building of his Cavorite Mining layout from textures and architectural detail pictures. 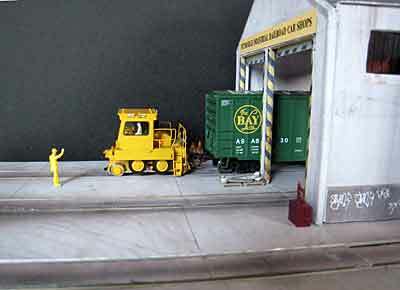 The dual-gauge O-scale layout (On30 and On18) measures 24x18in (60x45cm). The imposing central structure (remember, this is O scale!) was made from Clever Models texture papers glued to black foamcore board. 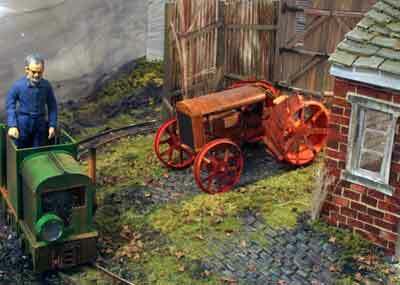 The outhouses (a Haigh layout trademark) are a free download from Paper Creek Model Works. Textures and architectural details are also available online for free download from Mayang Textures and CG Textures, as well as many other, smaller sites including: Brick Texture Library, FreeTextures.org, Free 3ds Textures, 3D Millenium, CGI Free Textures Library, Noctua Graphics, Absolute Background Textures Archive and two directories with links to many more good sites: Freebie Roundup and PhotoShop Support. LOTS OF FREE BUILDINGS ARE DOWNLOADABLE ON THE INTERNET! Regular readers of these pages will remember Howard Leroy Lamey, from Jacksonville, Florida USA. 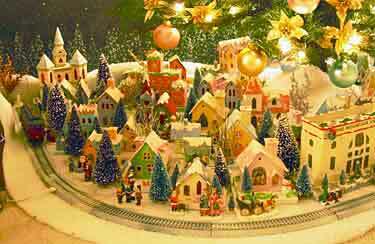 His miniature “glitter houses,” emulating Christmas decorations from past decades, have been featured several times in holiday Scrapbook issues. Now Howard and his fellow modeller, Paul Race, have introduced a free download of a classic American tinplate railroad station, Lewis Park Station (upper photo). It’s available as a PDF file and can be printed at various sizes to suit the scale you prefer. 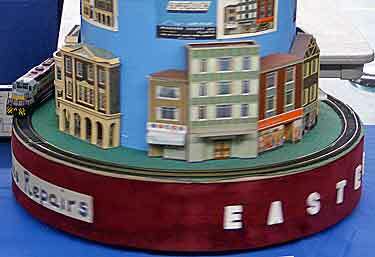 Howard’s site also offers free downloads of low-relief small-town structures (lower photo), called Easy Street. 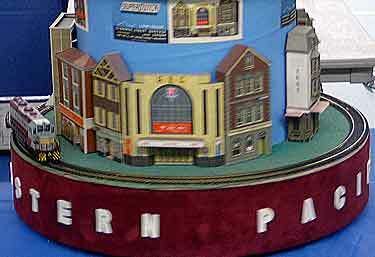 And there are others—including Union Station and a vintage barn and silo. There’s considerably more information, ideas, and downloads at Howard’s website. 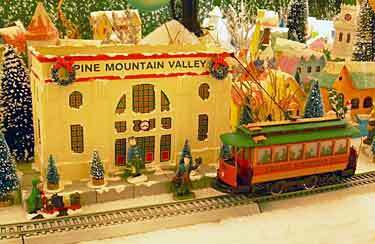 Paul’s website, BIG Indoor Trains™, also features free downloads of commercial-quality building fronts, as well as signs, textures, and more. Many sites on the Net (including this one) offer free paper structure downloads, in many scales. Here’s a short list of links to get you started. For more, just search “free paper buildings” in your favorite search engine. And remember… any downloaded file can be printed out in your scale! This Site—Abe’s Lunch stand (photo at right and see Scrapbook #57a). Main Street Train Station (Disney). A BIG model! Directories of free paper buildings include Thumbnail List, Paper Toys (long list, including Bill Gates’s house! ), Free Paper Models, Top Free Printable Scale Buildings, Canon Craftown, Free Paper Model Kits, and Paper Buildings Links. For instructions and modeling tips, try the Card Modeling FAQ. A variety of commercial suppliers now feature amazingly realistic paper building kits for model railways at quite reasonable prices. 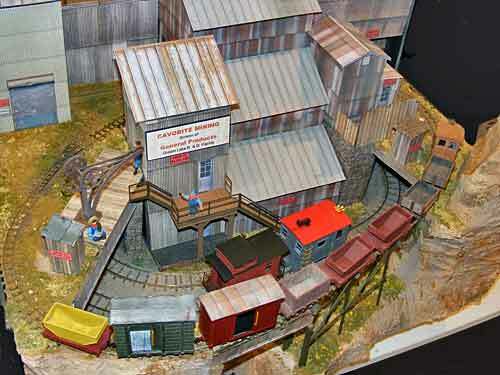 The shop building on Carl Arendt’s Carnegie Car Shops layout (at right) was adapted from Scalescenes.com‘s diesel house kit. The downloaded PDF files were printed out on matte paper, then glued to artist’s matte board or light card stock and trimmed to size. The graffiti and the concrete paving are optional parts of the kit (see Scrapbook #78a). There are also other suppliers of amazingly realistic paper kits, including Clever Models, Paper Creek Model Works, Looks Like…, Fiddlers Green Paper Models, Metcalfe Kits, and software to design your own, Model Builder (Windows only). Many sites include free downloads. Would you believe—nearly everything you see in these photos, except for wheels and track, is made of paper? 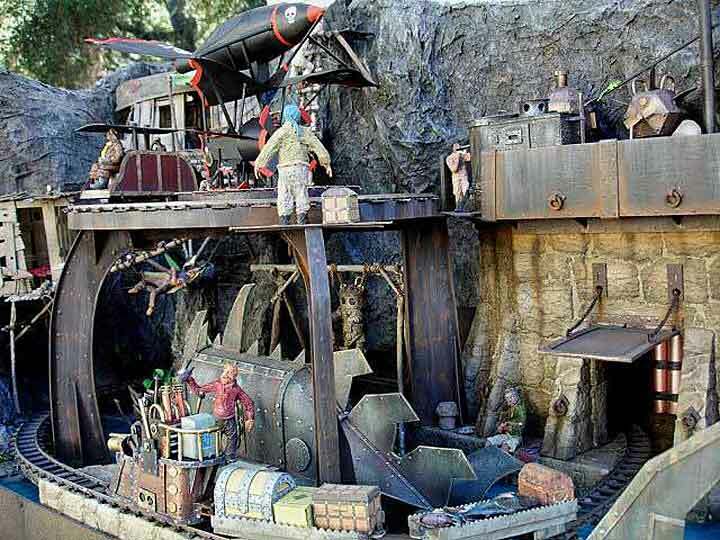 From papier mâché cliffs and walls to Strathmore paper locomotive and submarine, Chris Walas, from Santa Barbara, California USA, used many techniques to create Pirates Cove (see Scrapbook #72a). 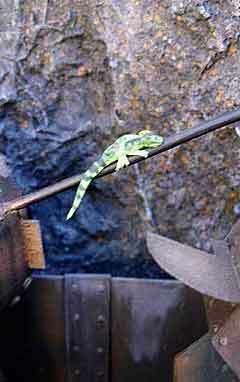 Even better, he posted a detailed description of his methods at the Gnatterbox, a very creative forum of Gn15 modelers. This layout won a Gnatterbox competition for small layouts built as completely as possible from paper materials. Online discussions of all the entries are available to anyone interested in creative paper modeling! The results of the competition (with photos of all the entries) are also available. Go to it! IMPORTANT FOOTNOTE—Paper modeling covers much more than we’ve seen on this page. A good example is the red tractor in the picture at right. 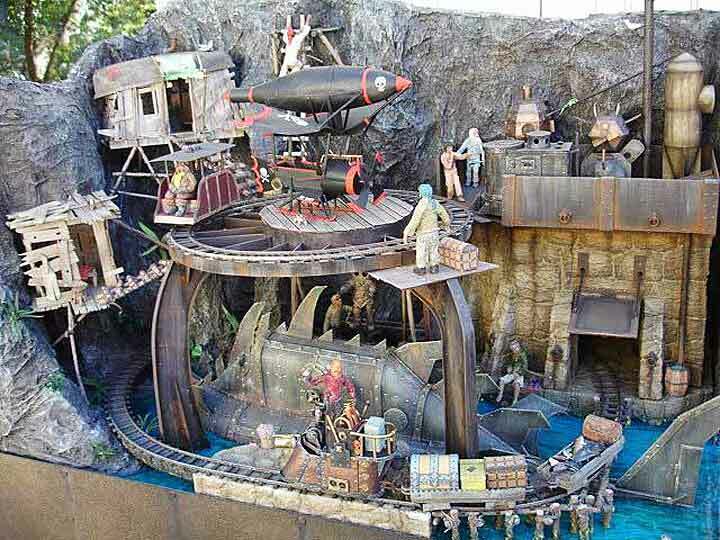 It was built by Andrew Milner, from Huddersfield, West Yorkshire, England, and is made entirely of cardboard! 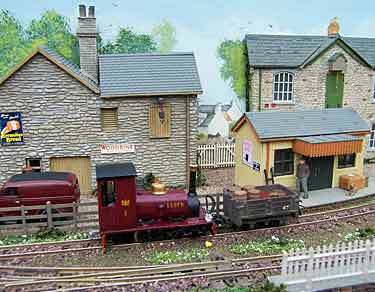 Andrew’s layout, Arthur Crumb, won second prize in the Gnatterbox paper layout competition. You can learn more about this layout in Scrapook #72a. 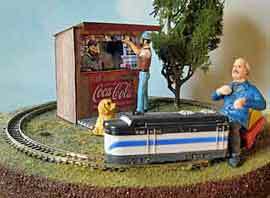 Paper modellers make creditable miniatures of a vast range of objects, many of which are adaptable for model railroad use. Their patterns and “how to” articles are spread all over the Internet. Good directory pages to start browsing are here and here.